Welcome to the Warren City School District. I am honored to be serving the Warren City School District in the capacity of Associate Superintendent. This is my 24th year in education, 22 years spent here in Warren. My connection to Warren dates back further though, as I am a graduate of this great school system. My service years in the district include teaching, administration and now working in the capacity through district leadership. 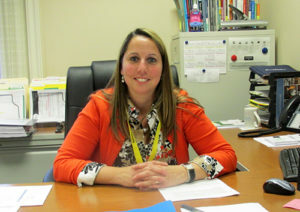 Through the Associate Superintendent’s office I oversee the Department of Teaching and Learning as well as Student Services and and the Technology Department. This includes the Office of Special Education, Office of Curriculum and Instruction and the Office of State and Federal Programs. I am focused on collaborating with the Department of Community Outreach to strengthen our SEL (Social and Emotional Learning) program in each of our schools to better meet the needs of our students as individuals in order to promote academic success. I co-facilitate the OIP (Ohio Improvement Process) which allows each level of leadership; from teachers, to building leadership teams to the district leadership team. We have built a district plan based upon goals and needs designated by our district report card. Monitoring our actions, reflecting, choosing researched best practices in the classroom, and looking at each individual child and his/ her needs will allow us to move our district forward. I believe in the success of our local schools. Our district is committed to bringing out the best in each and every child and recognizes that strong schools are the foundation of a strong community. Each day we work on instructional strategies that are aligned with best practices to give our students the best educational opportunities. We want our students to be independent learners, taking responsibility for their choices in learning and in becoming a caring, thoughtful, responsible members of the school community. We are committed in having high expectations for everyone within the school community as well in the surrounding community. The W.A.R.R.E.N. acronym exemplifies what we want for all of our staff, students, parents and community members. These traits (Work Ethic, Accountability, Respect, Responsibility, Effective Behavior and No Excuses) round out the total person along with the academic excellence the Warren City Schools offers. I am proud to be a Warren Raider!